PLANTATION — Skyla Osceola arrived for basketball practice Nov. 16 sporting a smile under a dark blue ball cap whose three letters revealed where the American Heritage School standout will play her college ball: NSU. 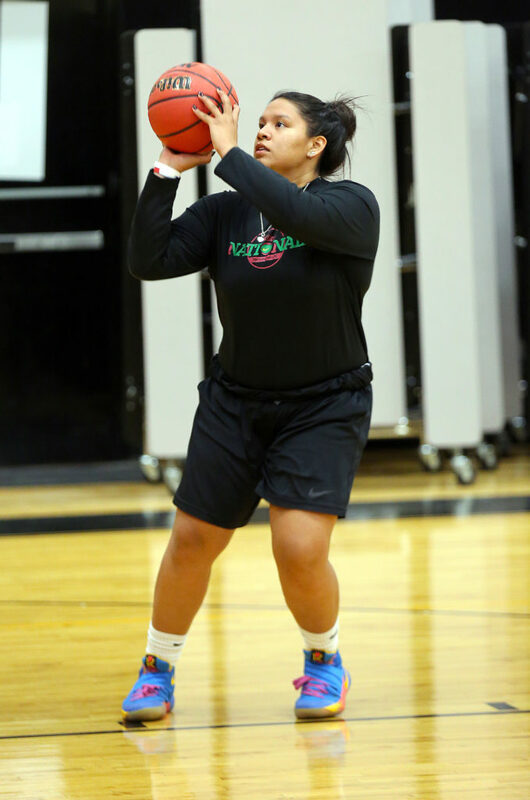 Skyla, a hard-working 5-foot-9 senior who can play any position for the Patriots, signed with Nova Southeastern University the night before in front of her family at home on the Hollywood Reservation, only a few miles from the Fort Lauderdale campus. Before practice began, American Heritage coach Greg Farias gathered the team in a huddle and announced Skyla’s college decision. Hugs and applause followed before practice got underway. “She’s the best shooter on the team, and people don’t realize how big she is, but she can guard the best player on the [other] team, too, small guard or big girl. She can play 1 through 5,” said Farias, who is familiar with NSU basketball having played for the men’s team in the 1990s. Farias helped his alma mater while helping Skyla, too. He alerted NSU about Skyla. It didn’t take long for NSU to like what it saw during a fall league game. “Within the first 15 minutes of the first game, [the coach] was already texting me, telling me ‘Thank you for calling me. We appreciate it, and we love her,’” Farias said. “From right when they saw me play in the fall league, they definitely showed a lot of interest in me,” said Skyla, who added that she “fell in love” with NSU during a visit. NSU plays in the Sunshine State Conference with fellow NCAA Division II members Barry, Eckerd, Embry Riddle, Florida Southern, Florida Tech, Lynn, Palm Beach Atlantic, Rollins, St. Leo and Tampa. Although she has already signed, Skyla will take part in American Heritage’s national signing day celebration with its other student-athletes this winter. Before she adjusts her tassel and shifts her focus to college, Skyla still has her senior season, one that carries even more significance than it otherwise would. This is a comeback year for Skyla, who missed her entire junior campaign due to a torn ACL she suffered while playing in a summer tournament with her club team the Miami Suns. Long-term injuries for high school basketball players in their junior year are especially cruel because it’s such a vital season to impress college coaches. Skyla said she didn’t dwell on all the negative aspects of having to sit out her junior year; instead she used the time off the court to reenergize her passion for basketball and her health. Skyla, who is active in crossfit training, comes from a talented basketball family that includes older siblings and former high school stars Ariah (Hollywood Christian) and Hunter (American Heritage) and dad Marl, an assistant coach for the American Heritage boys team. By signing with NSU, Skyla is etching a name for herself. “I’ve been known as Ariah and Hunter’s little sister and I just wanted to make my own name for myself so that with my younger siblings people will say, ‘There goes Skyla’s little sister or Skyla’s little brother,’” she said.